In recent years, the adoption of an independent and sustainable lifestyle has become increasingly attractive to a growing number of people. I am one of the many who seek such a lifestyle and, though I am far from reaching this goal, my journey has begun. Getting there will be neither quick nor easy, but I’m up for the challenge, and am taking things one step at a time. One project that has recently gripped my attention has been growing a vegetable garden. There is something powerful about the practice of planting, nurturing, harvesting, and eating your own food. I love the entire process, but couldn’t partake for the last few years. Since we bought a new home, our summers have been consumed with other projects like installing our lawn, landscaping, etc. It wasn’t until this year that I was able to spend time on my garden. We live on less than a quarter acre in the suburbs. As such, we don’t have a lot of space. At our previous house, I just tilled up a big spot in the back yard, brought in some compost, planted my veggies, and called it a day. Unfortunately, this approach doesn’t fly in suburbia. I don’t think that having a tilled-up back yard is against the rules of my homeowners association, but I do know it would attract many unhappy looks from my neighbors. Thus, I decided to install our new garden in pretty little planter boxes. I started with some very reasonably priced wood. Instead of using a common but expensive garden box wood like redwood, I chose to go with Douglas fir. The boards are much cheaper, but will still last for quite a few years. I ended up building two boxes, one for vegetables and the other for herbs. My veggie box is reasonably large at 4′ x 8′, whereas my herb box is much smaller at 2′ x 4′. When it came time to plant, I started out in two distinct rows but soon realized that I’d run out of space if I kept up that way. Thus, I started staggering the plants to make them fit. While I managed to fit everything in, I’m guessing that thing might be a bit crowded this year — especially for my tomato plants! Saves you money. The cost of produce is on the rise, and growing your own not only saves you money, it also frees you from the worry of fluctuating prices! You control the pesticide use. Can’t afford to buy organic? You can now! This will be our third attempt at a garden, and we have yet to use any chemicals. There are many natural ways to fend off pests and disease. One trick that my wife and I employ is to plant a Marigold border around our garden. Fresh and ripe. Store bought produce is often picked before it is ripe. This is done to prevent spoilage and decrease damage. The problem is, picking produce before it is ripe reduces its nutritional value. Great taste. The taste of a fresh, organically grown fruit, vegetable, or herb far exceeds that of its store bought counterpart. Ability to preserve. Growing your own food gives you an opportunity to preserve your food for use throughout the year. This allows you to enjoy the fruit of your labors even in the dead of winter. Education. A garden is a great way to educate your children about health, independence, and hard work. Free therapy. Gardens provide you with an opportunity to commune with nature, which is definitely good for the soul. Growing your own garden provides a glimpse of a simpler life that can be very rewarding. Couple the independence gained with the money saved and you have yourself a very powerful tool. Also, remember that you don’t need a ton of land to have a good garden. Here’s an example of great gardening in a small space. I’ll be a gardener until the day I die. What about you? Do you garden? If so…why? Hi everyone, it’s my first go to see at this site, and paragraph is really fruitful in support of me, keep up posting these types of content. Seems solarpanelsforsale resurrected this topic, which I wholly support. Spring is around the corner, as it is, so talking about gardening or giving an update is well within the realm of reason. To update my status, I am now relocated to my “new” house in the country on nearly 2 acres. Seeds are coming in, making it exciting to get going on the growing process. There’s been a lot of precip, both from snow and now rain. The snow isn’t over with yet. Since I have the space, I would like to over extend what I plan to grow; meaning, have far more available than is necessary for the two of us. I’d like to buy the balsam-like baskets or corrugated containers that veggies and fruits are sold out of and put it all in a barrow at the end of my driveway. The honor system is alive and well around these parts. Pay what you feel it’s worth and enjoy. 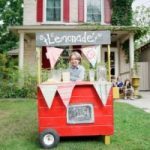 It would make me a little bit of pocket money, and since I plan to eventually turn this into a business out of my home/property, I will get a feel of what people are basically looking for. I’d also like to sell non-consumption plants – shrubs, trees, annuals and perennials from seed and propagating. Start small and go from there…. To the gal who commented on putting raised beds near the house, my raised bed is made of concrete. I have no cause to worry about tainted wood, but will be sure to look out for peeling paint from the house. Thank you for the tip. Hope to read more feedback from others who subscribe here. Great article. I started making a garden about 3 months ago with a few vegetables (tomatoes, eggplant, bell peppers, etc) and some herbs. Not only do the vegetables taste better, it is actually a lot of fun. 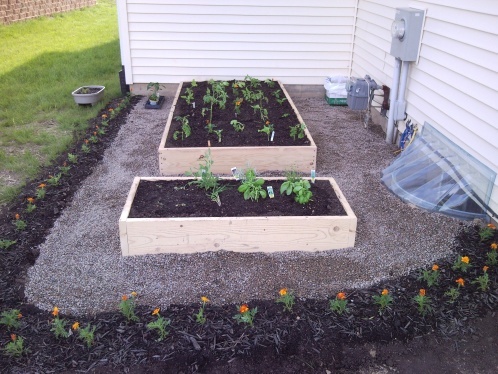 I don’t know if you’ve read it or not but “Square Foot Gardening” can give you some great ideas for how to get the most out of your raised beds. What a sad state of affairs we are in when having a vegetable garden is looked down upon by the neighbors. Sure your garden looks great but living in surburbia doesn’t mean people don’t like gardens. It’s your property so do what you want with it and if the neighbors don’t like it, tell them to close their eyes when they pass by, even if driving. If the deck near which you plan to put an herb garden is made of weather-treated wood, again, you should avoid gardening in that area entirely, or at LEAST do a soil test that tests for heavy metals. Many studies have shown that the soil in and around children’s playgrounds using pressure-treated wood contains arsenic and other stuff you don’t want to ingest. Anything constructed after 2004 (see attached article) would be ok. Interesting on the timing of this topic. My SO and I are in the process of purchasing a home. The one we made an offer on is in pristine (read that “move-in”) condition. This includes the 1.2 acres the house is on. Right between the ground floor covered [by the deck] porch and garage is a small garden designed much like yours. However, my plan is to convert that strictly into an herb garden and relocate the veggie garden itself to the back or side of the lot. Unfortunately, the countryside of northwest PA is replete with deer, so I would have to surround the garden with a fence high enough to keep them out. There’s also blood meal that works until the rains come and wash that out. That would be an ongoing purchase. A one-time purchase of perhaps a chain link fence would probably be the ticket. Fern, county extension offices will test a soil sample for you. Ours was free because we live in a neighborhood with known lead, but the most they should cost is $10-$15. We have a, I don’t know, 1/10 acre lot? So my garden is in little beds plus containers -t his year I’ve expanded to have some containers in the driveway. Our peas are doing great there, in an old recycling container w/a trellis. This is the first year my son is interested in the garden other than to destroy things, so it’s been a lot of fun. We’re growing tomatos, tomatillos, corn, squash, zucchini, cucumbers, asian greens, peas, borage, basil, lavender, sage, and flowers. I don’t count my time, since this is a hobby, but we spend about $50/year on the garden including seeds, starts, compost, fertilizer and random other supplies (this year: wood for a new raised bed. Last year: trellises.) Even in a bad year we get $50 of basil from terracotta pots on the back deck, easy – a year’s worth of homemade pesto. @Everyone: Thanks for your encouragement & for sharing your experiences. @Lysle: Cost is only one of the reasons to have your own garden…there are many other great reasons. Regarding cost, I do not have a statistical breakdown of my savings, but I do know it saves me a boat-load on store bought produce…especially organic which is what I buy. 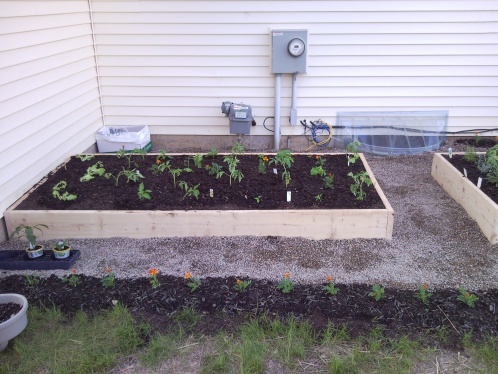 We put in a raised bed garden in this year for the first time on our little uban lot, 5 x12 – very much like yours, nothing overly fancy. In prior years, I just planted everything in pots – a few tomatoes, a few peppers, lettuce, and a bunch of herbs. Raised beds are great – very little weeding to be done, and once the plants are in, it’s only about an hour a week in work. This year there are 8 varieties of tomatoes, 3 varieties of peppers, zucchini, summer squash, lettuce, swiss chard, green beans, cucumbers and sugar snap peas – looking forward to lots of veggies! Growing up, we always had a garden. Marigolds, too. It was great to be able to pull a carrot out of the ground, rinse it off, and eat it fresh. I had one a few years ago, but a swimming pool now occupies its place. Someday. Maybe I can try container gardening. You have a nice, neat setup there, Matt. I love the Elizabeth Murray quote! I too have started a vegetable garden, although not as large as yours. Our salad last night consisted of the lettuce and herbs from the garden. It was really rewarding to eat what I have grown. I have an acre and a half but didn’t have a full-blown vegetable garden until this year. I’ve lived here 14 years.) Mainly due to the nuisance of deer and woodchucks who deccimate anythingin their path. But with rising food costs and the desire to eat organic, i invested in fencing and now have a 11 x 18′ foot fenced plot . .. in my front yard. I have much more land in the front, which also gets a lot more sun, than my smaller backyard, and my front yard is shielded from view anyway, so doesn’t matter what neighbors think. I woldn’t advise most of your readers to till a garden so close to the house. Even if you have vinyl or aluminum siding, if the house was once wood siding, every time the house was scraped before repainting, you could easily have gotten paint chips/flakes full of lead settle into the soil. 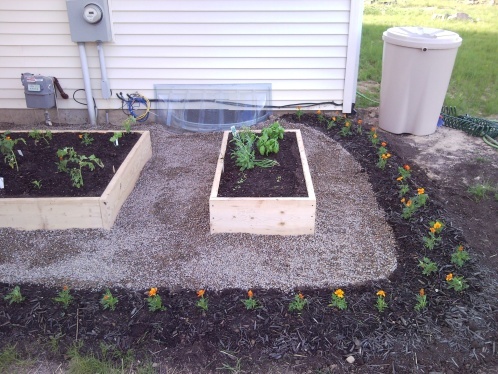 Nice raised bed gardens! Everything looks great! I’ve always wondered if planting a garden makes sense on a cost basis especially when you factor in your time. 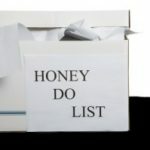 I’m a pretty busy person, so I can only do so much. How much time per week do you expect to put into tending the garden and then afterward handling of the final fruit of your labor? 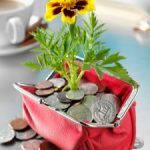 How much total expense (including cost of your time) does it add up to be compared to store bought? My fiancee and I just planted our “garden”. We have even less space – we’re renting! I love my little garden. I’d love to expand it – maybe next year. I have some tomatoes, lettuce, basil, oregano, thyme, sage and mint (in a container). Matt– Nice post and pictures. 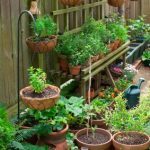 You may want to add containers to your garden as well. They can be moved and argued as temporary to pesky neighbors . . .